Wireless won’t reach? Don’t want to run any more cabling through your home? Powerlines are a great solution. Powerline networks use your home's electrical wiring to connect your devices, so if your WiFi is weak, you can get online without the need for super-length Ethernet cables. 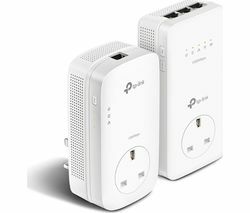 Hook up a powerline adapter to your broadband hub and you can get on the web from any room with a working socket. Ideal for those places where your wireless won't reach, powerlines are also incredibly easy to install. Plug one powerline adapter into a wall socket and connect to your router, plug the other adapter into a wall socket near the device you’re trying to connect – like your laptop or Smart TV – and you’re ready to go. The TP-Link powerline range provides up to 1200 Mbps transmission, for super-speed data transfer and smooth streaming around the home. Pass-through sockets mean no power outlet is wasted, as you can plug any electrical device into the powerline adapter and use as normal. Built-in WiFi allows you to connect your phone, tablet or laptop with ease. Get a stable, reliable internet connection for your devices, including Smart TVs, without the need for lengthy Ethernet cables. Powerlines are a smart way to get connected without the clutter. 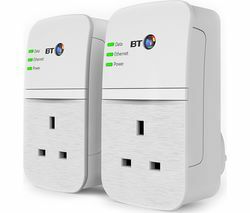 Check out our full networking range to find out about more ways you can connect your devices at home.